Can you teach an old dog new tricks? Chloe is going to be 11 this winter, and last year I wanted to teach her to speak. It took a whole year, but she finally did learn. Here she is showing off her talents. But as for me, can I learn to stick to my budget? I realized I hadn't worn the top I got at TJMaxx in September. Since it still had the tags on it, I thought I would return it. The whole point of the budget was to spend my money on things I love, so the fact that the tags were still on over a month later was a clear sign that I wasn't in love with the top. But I didn't just bring back the shirt and leave. I browsed, and inevitably found things I liked. 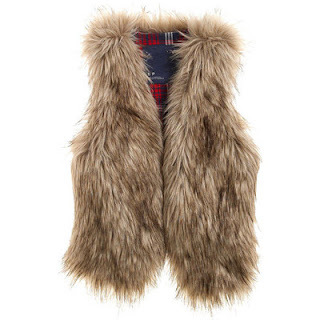 I found the exact same fur vest that my sister got. It's by American Eagle (past season) and was only $20. While I carried it around the store, three people stopped me to tell me how much they loved it, ask where I found it, and ask me how I planned on styling it. So I had to get it (because my sister wont be too keen on my repeatedly stealing hers). At this point, I needed to just leave. But then I spotted this striped dress. And what with my new found love of stripes and sweater dresses... I tried it on. and I took it home. It was $25, which means I am negative $20.72 for the month. Should I bring it back? Should I deduct it from next month? Should I make the next four weeks a complete shopping ban as punishment? Or do I realize that starting a budget after years of not worrying is a hard thing to do, let it slide, and start fresh in November? I know so many of you are on budgets right now, so what would you do? Which made me think that during the winter, what if I planned out all my outfits on the weekend and photographed them when I didn't have to worry about catching the light. The pros would be, getting all my outfits planned ahead of time, and being able to get the photos I want. The cons would be having to commit to the outfits for the week (and trusting the weather forecast), also having to get dressed, take photos, change, take photos, change, take photos (you get it), which could potentially take a few hours of my Saturday. I think I might give it a try though, and see if the pros outweigh the cons. I also finally switched out my closet, and added some more things to the shop! Yeay Chloe!!! She's so cute! It's tough planning ahead for outfits that far in advance - I say more power to you if you can do it! If you can afford it, keep it all and just deduct the $ from November. Also, I love the vest and dress, so I don't blame you. I was also considering taking all my photos on the weekend so I can still catch the light, but like you say, what if it's colder/warmer/something changes. I guess it just depends on what you'd rather do! I love your smile in the last picture. Adorable! Sounds like a good plan but will require planning ahead. Let us know how it works out for you. I say deduct it from November. That is a fab dress. I would be so impressed by your planning skillz if you took all your pics over the weekend. love your necklaces! 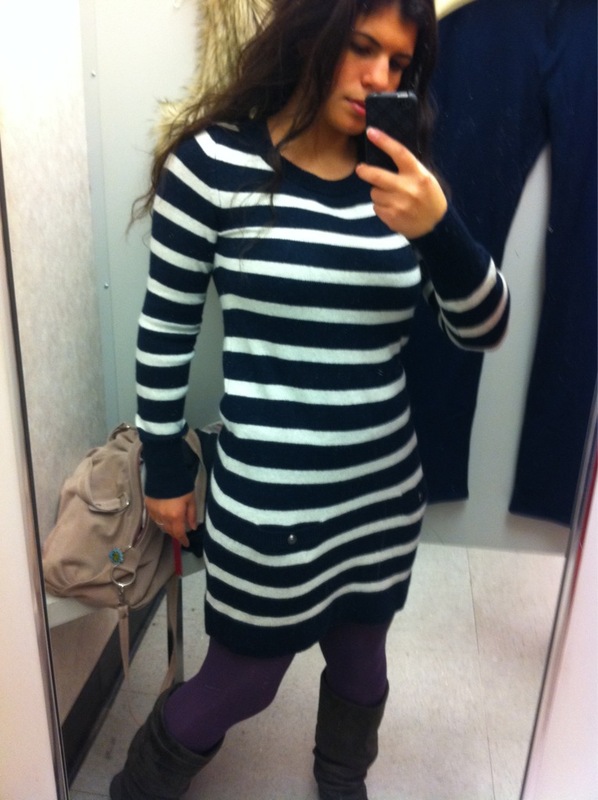 very pretty with the stripes and thick knit! I say keep it because if you love the dress keep it! You would regret returning it but I doubt you'd regret the 20 bucks. Deduct it from next month, but don't go over in November!! your dog is adorable! and i think you should take the money out of next month's budget. that always seems to work the best for me! love the dress by the way! love the vest, I have been trying to find a nice fur vest for myself with no luck. Cute outfit with the sweater and stripes, looks very cozy, now about the budget, it's just like a diet you have to take it day by day and don't beat yourself over one slip, get back at it and try not to spend more than your budget next month. Thank you for the lovely comment. It was very encouraging. I hate budgeting. Isn't it just awful when you break them? I am sure you will find something that works for you. I plan my outfits at least a day ahead of time, but ideally try to get it all figured out on Sundays. I do pictures ahead of time when I get the chance too, but only because my schedule is pretty crazy on the days I actually go to work. I like today's outfit - that sweater looks so cozy and comfy! the fur vest is so cute!!! Awhhh your dog is super cute and smart! I wish to own one, I had to let mine go after my high school graduation because nobody wanted to take care of him at home! You have an excellent taste in accessories, I love all of them! I totally get that feeling, budgeting is hard! Especially when I have to pass by our favorite stores so many times, it's like they are begging me to enter! So far, I haven't have any record for not breaking my budget LOL so silly! Your dog is so well behaved! Nice work teaching him so many tricks and being dedicated enough to teach him to speak. I love the sweater dress. So I vote for keeping it. It's a classic. Whenever I go over my budget, I try to just take a deep breath and do better next month. Actually, I just try to avoid stores completely, or else I would undoubtedly find something to buy! love your style, love your blog! let's follow each other? i am looking for a similar faux fur vest... and your dog is so cute! Go Chloe ... so you can teach an old dog new tricks after all. She's adorable. I love the fur waistcoat, so young and hip :-) Don't give up on your budget, admit your mistake and just carry on from where you are, if you put it off until next month, you may find yourself putting it off over and over again. Chloe looks so proud of herself in this video! I like the fur vest and the dress so I would just keep them and start fresh next month like you said! Ps: I am hosting a $50 gift certificate GIVEAWAY today, so please join in :) ...I bet you will love it!!! And Chloe is SO cute :)) So excited to do her tricks, loved it. I think you should give yourself a break this month but really try to make it up next month. Just making the effort is a huge step. LOVE the fur vest - I want one! I am heading over to AE online and crossing my fingers it's there...I missed out on the ON one! you have such a FABULOUS SMILE! :) LOVE IT! Cute picks! Cute puppy! Cute cute cute. And interesting idea about taking pictures over the weekend! I know I could never commit to outfits in advance like that, but I'll be interested in hearing if you can be so organized! Omg when she crawls its SO CUTE!!!! I am loving Chloe... she looks like a puppy !!! My dogs are totally deaf, well either they are or they just ignore me. They do not follow instructions. They two little crazy girls. I adore your new fur jacket, its FABULOUS. Have to be honest about the dress, take it back. Oh this is great, because I love stuff like this. Challenging yourself is hard especially when it comes to saving money and making the most of what you already have. I say keep the vest (it's amazing) and take back the dress. You will feel so much better about not being in the negative (that much at least) and next month is a new month for you to go back for the dress it will probably still be there. If not, you will most definitely find one similar. Let us know what you end up doing, I'm curious now! I adore how happy you look in that last picture!! !